I’ve hinted elsewhere on this blog that I’m a bit of a product junkie who has been curbing her habit through simplification and Birchbox samples. 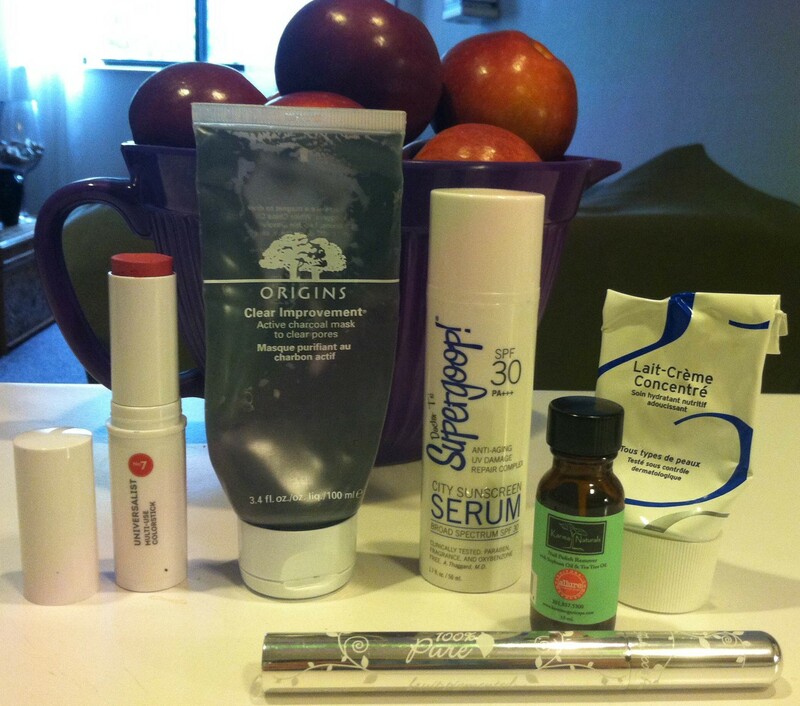 Recently, I’ve been giving away or tossing samples or products that I’m never going to use or that are expired. That, paired with summer traveling, has lead me to really assess which products I consider essentials. While I don’t normally do beauty reviews, I wanted to share these products because they’ve been “game changers” for me and because, for the most part, they’re made of ingredients that aren’t scary. For more on the ingredients in your beauty products, the blog/book No More Dirty Looks is an amazing resource. It’s worth noting how many of these products I discovered either through samples in my Birchbox* or recommendations in editorial content. That alone has made my box worthwhile. Plus, a bunch of these I bought, at least in part, with points. If you’re not reviewing your samples each month, you’re missing out. Others I got for reduced prices on Ebay because I am broke like that. 1) W3LL People Universalist Mutli-Use Color Stick: This bad boy I got using points at Birchbox after sampling it in my February box. My sample was Dusty Rose and it was a beautiful color for adding a bit of a rosy cheek on a makeup-free look. I ended up buying Creamy Peony, but only after an exchange. Some of the colors have glitter in them and I accidentally bought one of them. To me, it defeats the purpose of a natural looking makeup product if there’s glitter. Anyway, I love this product because it’s made just from plant-based and mineral ingredients and packs great color. I use it for my blush and on my eyelids on most days. In a pinch it works as lipcolor too. The tube is huge and doesn’t expire for 2 years. Considering that it works as up to three products, I consider that kind of a bargain too. 2) Origins Clear Improvement Active Charcoal Mask: I use this one at least once a week. It kind of lives in infamy in my house because of the time that Julio wanted to use Facetime and I replied, “No, I’m wearing a black face mask.” And, for reasons maybe you can infer, he made fun of me for a long time. Anyway, it packs a lot of punch when it comes to drawing junk out of your pores and helps keep my acne prone skin happy. I got that bottle at least a year ago, so you can see that a little goes a long way, too. 3) Supergoop City Sunscreen Serum SPF 30: I found this product thanks to a Birchbox video about sunscreen myths. I’m a bit of a sunscreen nut. I wear it everyday after I found a dark spot on my face in my mid-twenties. That was a bit of a “come to Jesus” moment. I have troubled skin (which is a nice way of saying “bad skin” when your skin is sensitive, too) so it was hard to find a daily sunscreen that didn’t break me out. This stuff is amazing. It’s light and moisturizing without sacrificing SPF. Plus, it doesn’t include some sunscreen ingredients that environmentalists raise their eyebrows at. 4) Embryolisse Lait-Creme Concentre: This French beauty staple saved my skin during the Polar Vortex. It’s creamy and moisturizing and doesn’t include parabens or other yucky preservatives. Even with my sensitive combination skin, I can use it as as a night moisturizer for most of the year and it doesn’t break me out. A little goes a long way. I love it. 5) Karma Naturals nail polish remover: I don’t do my nails that often, but I was able to try this product and wanted to include it because it is all-natural, smells great, and actually works. I was doubtful that an organic nail polish remover could do the job, but it really does. 6) 100% Pure Mascara: Another Birchbox find. I didn’t get it in my box when they sampled it in January, but I saw it in the preview video and had to have it. Thanks to points, I do. I wear mascara almost every day. Even if I’m not wearing any other makeup (which is many days), I’m usually wearing mascara. I love this product because it lengthens my lashes and makes me look more awake without putting chemicals close to my eyeballs. It’s made with fruit and tea pigments so it smells lovely too. What are your skincare/make-up must-haves? How picky are you about what goes into your products? *Which, P.S. is owned and largely operated by women and features a range of beauty styles and races/ethnicities in their videos by using their own staffers from execs to software engineers. So many good things. Hey I just came across your blog and I love the content! Maybe you could check out my blog and tell me what you think?